Your vacation starts as you arrive at the Star Line dock. Friendly smiles greet passengers to top that off – every passenger gets to sample some of that famous Mackinac Island fudge. Once you board the ferry and settle in for an exhilarating ride (inside or on the open-air top deck) on a Star Line ferry. Everybody will get a kick out of the site from the unique Water-Jet Rooster Tail as the ferry travels across the Straits of Mackinac towards Mackinac Island. The Straits of Mackinac connect two of the Great Lakes: Lake Michigan and Lake Huron. 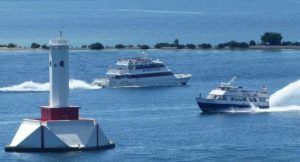 After approximately 18 minutes across the Straits of Mackinac the Star Line Ferry glides up to the dock on Mackinac Island. As soon as you arrive, you’ll find a bustling harbor, porters unloading and loading luggage aboard the horse draw wagons and carriages that deliver guests to the many island hotels. Mackinac Island is suspended in a forgotten, more innocent time. Nothing compares to a carriage ride or bike ride around the island as the smell of fresh fudge wafts through the air. Night owls can escape the night chill in one of the Island’s many lively pubs. Waking up to the clip, clop, clip, clop of horses traveling the streets of Mackinac Island. Heck, the sound of the horn announcing the arrival of the first Star Line Ferry is the most pleasant alarm clock you will wake up to. Did you know Star Line Ferry also has a spectacular Sunset Cruise? 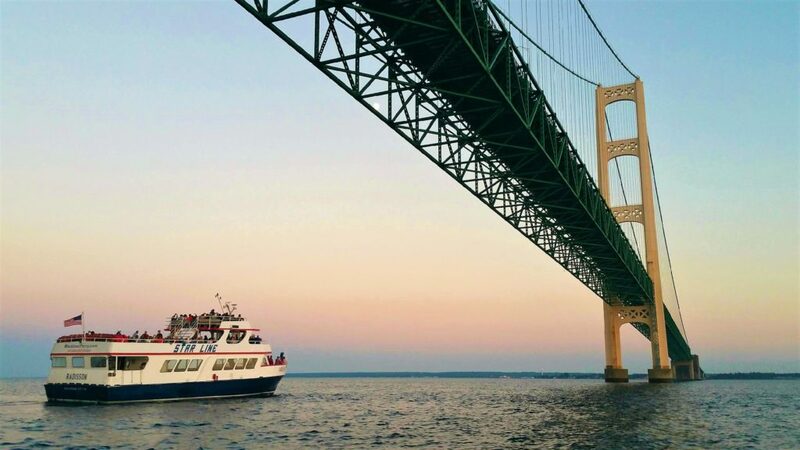 This cruise navigates through the Straits of Mackinac and includes a narrated tour with a spectacular Lake Michigan sunset under the Mackinac Bridge to end the night. A sunset under the Mackinac Bridge is an unforgettable moment. The Mackinac Bridge (fondly nicknamed ‘Mighty Mac’) is the world’s fifth largest suspension bridge, connecting the Lower and Upper Peninsula’s of Michigan. Star Line has been delighting passengers traveling to Mackinac Island since the 1970’s. 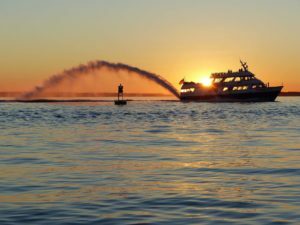 The iconic Star Line water-jet rooster tail and the friendly Star Line team make for an experience that enhances any Mackinac Island visit.